Experience the Ultimate Chocolate Sensation! Abbott Party Rental (the Chicago chocolate fountain rental source) is excited to present The Chocolate Fountain, a great new addition to any function! If you are looking for something unique and elegant, then you've come to the right place. Our Chicago chocolate fountain rental, The Chocolate Fountain, adds a touch of class to any type of event. Dipping your favorite fruit, marshmallows, pretzels or cookies into the chocolate fondue fountain is not only scrumptious; it's entertaining as well! Imagine the reaction of your guests when they see and smell rich, creamy Ghirardelli chocolate cascading down a decorative fountain. Add a fountain of tantalizing chocolate to your next event and make a lasting impression on your guests! Its perfect for any occasion, including weddings, black tie affairs, anniversaries or birthday bashes! Let your imagination go wild with all the creative possibilities for this fun, fresh idea. See our Chocolate Fountain ideas page for more great ideas. The Chocolate Fountain when operating looks like a three-tiered chocolate wedding cake. Gourmet chocolate cascades off of each layer in sheets and guests dip skewered fruit or food items into the chocolate flow -- pure heaven. Our Chicago chocolate fountain rental is in big demand at weddings, Bar Mitzvahs, anniversary parties, birthday parties, corporate events, and other various functions. In fact, the chocolate fountain can be used at just about any event where you are looking to amaze guests, attract attention, or make a lasting impression. At Abbott Party Rental our chocolate fountain rental packages include local delivery and pickup, setup and tear down of The Chocolate Fountain, cleaning, 25 lbs. of Ghirardelli chocolate (semisweet), a Chocolate Chef and a five hundred bamboo skewers. Call or email us for a quote on a chocolate fountain rental today! See the images below for great setup ideas and inspiration. 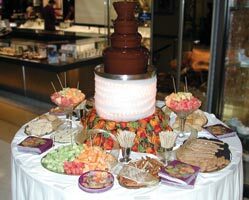 Abbott Party Rental is your Chicago chocolate fountain rental source. As a leading Chicago area Chocolate Fountain dealer, we provide you with the highest quality rental packages as described above. We would be privileged if you would consider us your Chocolate Fountain dealer of choice. Learn more about The Chocolate Fountain. The possibilities are endless; what can you think of that would go great with a rich, flowing chocolate fondue fountain? 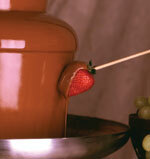 See our Chocolate Fountain ideas page for inspiration on dipping items and party themes.